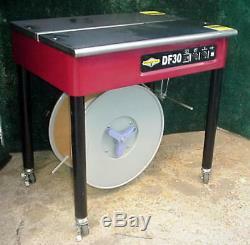 Dynaric DF30 Semi-Automatic Strapping Machine 1/4" - 5/8" Strap + 4 Rolls Strap. Per Roll, 3 New in Box, One Nearly New Roll On Machine. 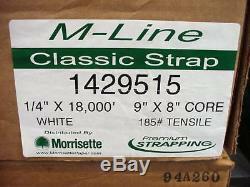 Strapping M-Line Classic: p/N: 1429515- 1/4" x 18,000 Feet, 9" x 8 Core. Used, Tested- Works Great, Looks Great! 2 Identical Units Available (at time of listing). Serial Numbers: 5208 & 5391. 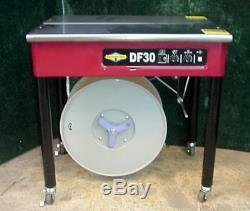 The DF-30 is an economical, easy to use strapping machine designed to run 1/4 5/8 strapping. Offering added safety for the operator the DF30 has been redesigned with rounded corners, as well as an audible cycle alert safety signal. An ACASS is given when the strap has been inserted into the sealing mechanism prior to tensioning. 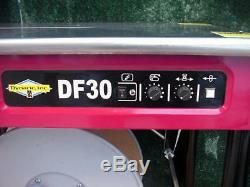 Dynaric DF30 SPECS and FEATURES. Utilizes two DC direct-drive motors, eliminating the need for clutches and brakes. Improved strap feed system eliminates slipping during tensioning even under the harshest conditions. 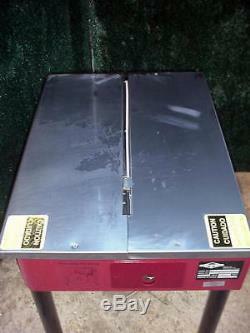 Operates on 115 volt single phase power. Fast cycle time: 25-30 per minute. Audible cycle alert safety signal (ACASS) system. Strap feed and tension externally controlled. Minimal maintenance and lubrication required. 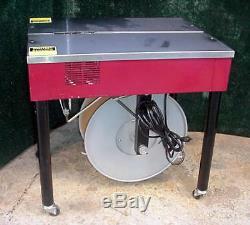 Casters allow for easy movement within your facility. Limited number of moving parts. Quick release feed wheel system for easy clearing and cleaning. Dispenser braking system with no belts to wear out or adjust. Overall Width: 22.4 (570 mm). Overall Length: 29.2 (760 mm). Overall Height: 29.1-30.7 (740 mm-780 mm). Machine Weight: 149.9 lbs. Sealing Head Location: 11.0 (280 mm) from the right of the machine. Power Supply: 115V Single Phase Cycle Time: 2.0 Seconds. Cycle Initiation: Strap Insertion with ACASS System. Package Size: 4 (102 mm)H x 2.4 (61 mm) W. Mobility: 4 Casters, two are locking. Strapping Size: 1/4 (5 mm) - 5/8 (15.5 mm). Dispenser: 9 (229 mm) I. Unit and rolls of strap will be secured to a pallet , stretch wrapped in plastic, and loaded onto a truck FREE of Charge! If a business, do you have a truck height loading dock or forklift to unload the unit when it arrives? Requests made at night will be answered the following day, requests on the weekend will be answered on Mondays. You are welcome to visit our facility and inspect this unit. We are a business with a loading dock. 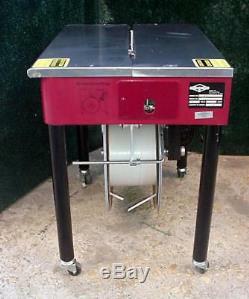 This item is located in our Rockingham NC 28379 warehouse. Mailed Payments and item pick are at the following address. We have acres, warehouses, and storage trailers full of machinery, equipment, and supplies from almost every industry. 99 with NO Reserve Prices!! Keep an eye on our auctions! We are a Business with a Loading Docking. We will do the same for you. FREE scheduling, supersized images and templates. Over 100,000,000 served. Get FREE counters from Vendio today! 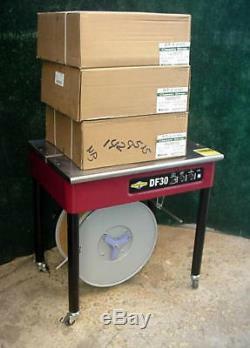 The item "Dynaric DF30 Semi-Automatic Strapping Machine 1/4 5/8 Strap + 4 Rolls Strap" is in sale since Monday, July 16, 2018. This item is in the category "Business & Industrial\Material Handling\Packaging & Shipping\Filling & Sealing Machines\Strapping Machines". 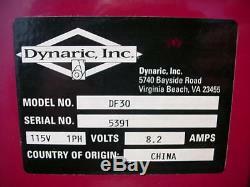 The seller is "surplus_carolina" and is located in Rockingham, North Carolina. This item can be shipped to United States, Canada.